It���s your world. Transform it. Go from maintaining to innovating. From watching change happen to making change happen. From where you are, to where you need to be. In other words, change your world. Business Service Innovation strategies from CA Technologies can help you deal with the challenges of a world dominated by cloud, big data, new modes of access and ever-increasing consumer demand. Embrace it. Transform it. 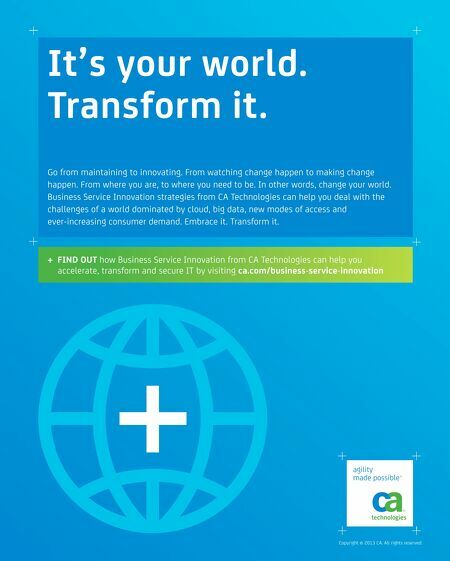 + FIND OUT how Business Service Innovation from CA Technologies can help you accelerate, transform and secure IT by visiting ca.com/business-service-innovation Copyright �� 2013 CA. All rights reserved.